A pole pruner designed for easy handling and reduced user fatigue. Whether you are tackling low-hanging branches or trimming higher ones, you want to do your pruning jobs with ease and comfort. With the HT 103 Pole Pruner, get ready for a tool designed to reduce fatigue and improve handling. Its telescoping design increases rigidity while extending and easily locks into position, letting you prune high branches with precision. This reduced-weight pole pruner also has a large fuel tank providing 30% longer run times than previous models. Combined with features like the semi-automatic choke lever, one-touch stop, no-slip grip clamp and 1/4" STIHL PICCO™ Micro™ 3 (PM3) saw chain, you get a fast and convenient tool that makes clean cuts. Anti-Vibration System: STIHL has a system for minimizing the vibration levels of handheld outdoor power equipment. The STIHL anti-vibration system helps reduce operator fatigue and provides a more comfortable working experience. Multi-Function Control Handle: Having easy access to all of the controls on one comfortable handle helps makes it easier to complete tasks so the operator's hand never has to leave the handle. 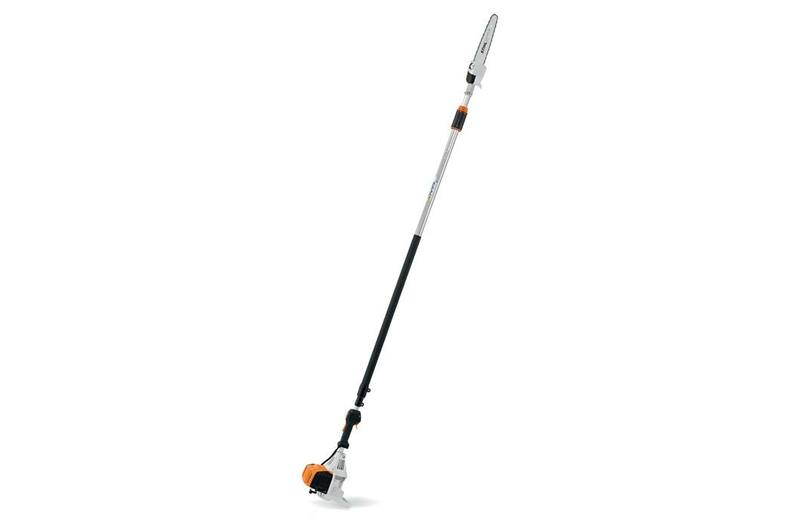 Telescoping Pole: With an adjustable shaft, telescoping pole pruners can cut branches up to 16 feet above ground. Purge Pump Primer: At the press of a button, this small fuel pump delivers fuel to the carburetor, reducing the number of starting pulls needed after an extended break between uses. Overall Length: 7'6" to 11'6"
The actual listed guide bar length can vary from the effective cutting length based on the gear head design. *Dry weight.